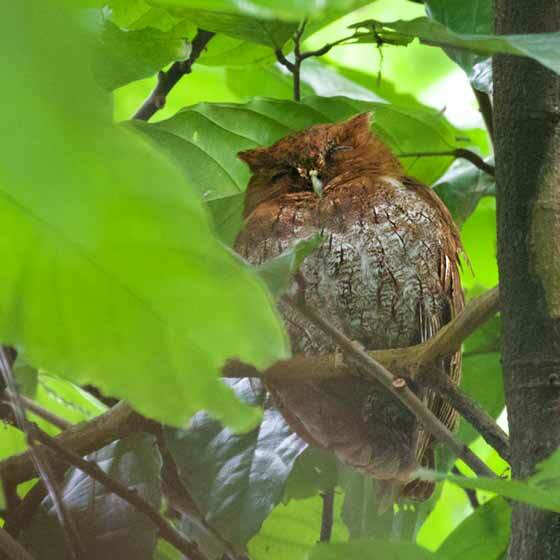 One of the prizes of The Lodge at Pico Bonito, in Honduras, is the sight of a Vermiculated Screech-Owl. I'm sure I would never have found this robin-sized bird without the aid of our guide, Elmer Escoto. He led us through a cocoa plantation (maintained just for wildlife) and steered us deep into a dense forest. In the trackless woods, Elmer stopped and told us to look up into the canopy. There, up high and barely visible through a tiny window in the leaves, was the small owl. We had to take turns standing where we could see it. Bird Brain is a birding database for Macintosh computers. It keeps your world life list, any country list, backyard list, yard list, and more. And your notes and photos, too.